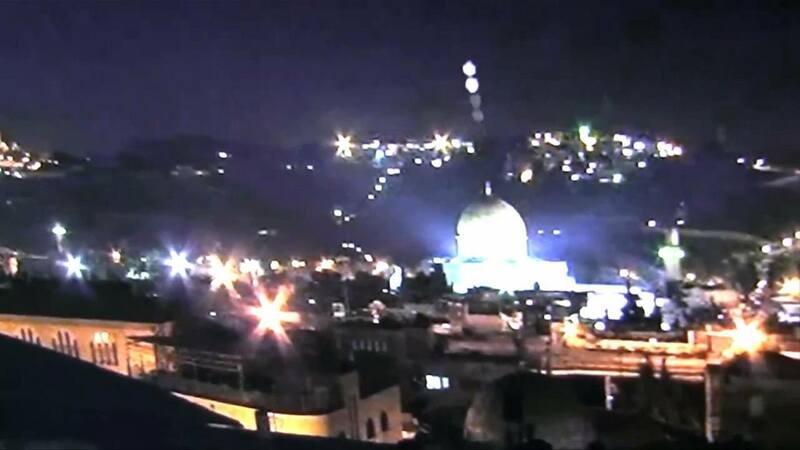 Credible evidence of a UFO over the Rock of the Dome in Jerusalem has emerged from last Friday, 28 January 2011. The UFO was captured on video by at least four independent people who have posted this evidence on Youtube. Marina seems to be hitting the mark with her Moon phase reports. The full Moon the week before this UFO encounter was titled Star Wars and mentioned relating with our star buddies. The horoscope below for this UFO sighting here shows the Part of Fortune opposite the 29 Cancer Full Moon degree. That Full Moon was on a star called alpha Monoceros, the brightest star in the Unicorn constellation. Back in July 2009, there was a massive solar eclipse on this star. It was the longest total solar eclipse since 363 AD, which also was on the same star, alpha Monoceros. When researching this star I found it had an association with Israel, in and in particular the Temple in Jerusalem. After the July 2009 solar eclipse there were news reports that Israeli PM Netanyahu would try to rebuild the Jewish Temple. Just before the 363 AD solar eclipse on alpha Monoceros, Roman emperor Julian commissioned the rebuilding of the Temple. After the eclipse an earthquake permanently halted the rebuilding, “The pagan historian Ammianus Marcellinus, a contemporary witness, reported that balls of fire erupted from the foundations, burning the workmen” The Solar Eclipse and 363 AD. I reckon the ‘oh we see these all the time in Mississippi’ is fake, but the other two hmmm. Wow. The crop images matching the transmissions is just far out!. How could anyone fake those designs from the ground in such detail and still match the transmissions!? I always thought crop circles were abit silly until one day i just started browsing on the web and I thought, blimey, there quite a lot of these damn things. EVEN if they are fakes they are really gorgeous works of art . It’s a chopper. When the news broke out, one of BBC’s first footages actually caught this chopper on frontal cam. Therefore I reckon there were at least 3 choppers hovering above the coastline when the tsunami got inland. There could be more. I commented on another thread about these vidoes too. Something fleeing in that direction would not be a space craft, they would go straight up. I think the videos are faked. There is a group saying it is the returned Christ. They are fake. they have their third exodus going on in Baja . I was there, and these people are criminals. They are a dangerous cult. Run by criminals.